Great to see Locked In escape rooms in Abergele. This is how it works: you get locked in a room with 1-5 mates and you’ve got just one hour to escape by solving tricky puzzles. Here’s some more info about Locked In Live Escape Games in North Wales – Abergele. It’s a real-life room escape game based on computer escape games. Escape games are quite a craze. After entering a room with your team of up to 6 people, you’re locked in. By the end of 60 minutes, you must work together to find the clues, solve your puzzles to secure your escape. This is suitable for ages 12 and up. Children under 16 are welcome in the rooms with adult supervision. Participating in the activity may require climbing a flight of stairs to enter the building at certain points. Parties, small groups and corporate team building activities can be booked. There’s a note on their website to say that you may need to ring the buzzer if the door is locked. 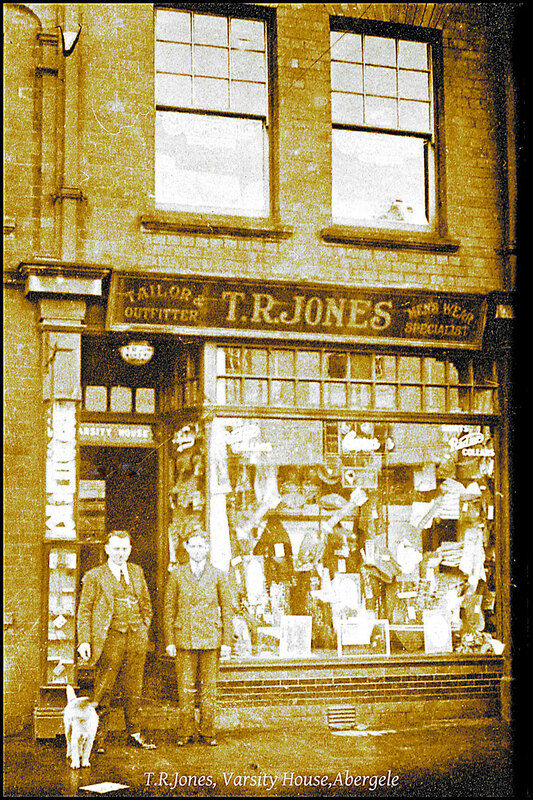 From the Dennis Parr Collection, here’s an old photo of the T R Jones shop in Abergele, date unknown. This men’s tailor and outfitter’s shop was located at Varsity House, Market Street. Perhaps on the pavement in the foreground was a note to tell the dog to keep looking ahead at the camera. From the Dennis Parr Collection.